Join Us!!! We are looking for someone to help us cover Antiguan basketball. Please send us an e-mail. Cutie Ovals Apr.25 Potters S.
This derby game ended with only one-point defeat on the road of 5th ranked Ottos (5-4) to first ranked Cutie Ovals Ojays (7-1) 77-76 on Sunday evening. Cutie Ovals Ojays forced 23 Ottos turnovers. Worth to mention a great performance of American guard Joshua Minner (198-90, college: MidAmerica Ch.) who helped to win the game recording 30 points and 4 assists and the other American import point guard Jermaine Bolden (178-86, college: Morgan St.) who added 12 points, 5 rebounds and 12 assists during the contest. Guard Xavier Meade responded with a double-double by scoring 20 points and 12 rebounds. Ottos' coach rotated ten players in this game, but that didn't help. Cutie Ovals Ojays have a solid four-game winning streak. They maintain first position with 7-1 record, which they share with Potters S. Ottos at the other side keep the fifth place with four games lost. Important game to mention about took place in . Second ranked Potters S. (7-1) saved a 2-point victory at home edging 5th ranked Ottos (5-4) 69-67 on Thursday evening. The winners were led by Jacob Llyod who scored that evening 14 points and 4 assists and Kareem Edwards supported him with 10 points and 10 rebounds. Even a double-double of 11 points, 15 rebounds and 7 assists by the former international center Mahijah Davis (195-77, college: Cent.Oklahoma) did not help to save the game for Ottos. Potters S. have a solid three-game winning streak. They keep a position of league leader, which they share with Cutie Ovals Ojays. Ottos at the other side keep the fifth place with four games lost. Baldwin Braves (#4) were upset in by seventh ranked Stingerz 83-75. The best player for the winners was Leroy Percival who had a double-double by scoring 16 points, 12 rebounds and 4 assists. Brian Holmes produced 26 points, 6 rebounds and 6 assists for the hosts. Baldwin Braves' coach tested ten players, but that didn't help to avoid defeat in this game. Stingerz (4-3) moved-up to sixth place. Loser Baldwin Braves keep the fourth position with two games lost. ABBA top team - Flyers (6-2) had no problems winning another game. This time they crushed eighth ranked Freetown T. (1-5) 94-64. Kwame Brathwaite orchestrated the victory with a double-double by scoring 21 points and 12 rebounds. Flyers have an impressive five-game winning streak. Despite that victory Flyers went down to third position due to points difference. Freetown T. lost fifth consecutive game. They dropped to the ninth place with five games lost. The game in was also quite interesting. Second ranked Potters S. (7-1) played at the court of 7th ranked Stingerz (4-3). Potters S. managed to secure a 4-point victory 88-84 on Thursday. Worth to mention a great performance of Kareem Edwards who helped to win the game recording 30 points, 6 rebounds and 4 assists. Potters S. have a solid three-game winning streak. They keep a position of league leader, which they share with Cutie Ovals Ojays. Loser Stingerz dropped to the sixth place with three games lost. In the last two games of round 8 Yorks Crushers destroyed Rebels on the opponent's court 97-77. Potters S. managed to outperform HS Outlaws in a home game 90-76. ABBA top team - Flyers (6-2) had no problems winning another game. This time they crushed eighth ranked Freetown T. (1-5) 94-64. Flyers dominated down low during the game scoring 58 of its points in the paint compared to Freetown T.'s 30. They outrebounded Freetown T. 61-30 including a 41-20 advantage in defensive rebounds. Flyers players were unselfish on offense dishing 24 assists. Kwame Brathwaite orchestrated the victory with a double-double by scoring 21 points and 12 rebounds. Canadian center Torey Fassett (198) contributed with 20 points, 7 rebounds and 4 assists for the winners. Guard Marlon Davis (-77) replied with 16 points, 8 rebounds and 5 assists and guard Teon Joseph (-77) added 13 points and 9 assists in the effort for Freetown T.Both teams had four players each who scored in double figures. Flyers have an impressive five-game winning streak. Despite that victory Flyers went down to third position due to points difference. Freetown T. lost fifth consecutive game. They dropped to the ninth place with five games lost. Second ranked Potters S. (7-1) saved a 2-point victory at home edging 5th ranked Ottos (5-4) 69-67 on Thursday evening. Potters S. forced 33 Ottos turnovers. The winners were led by Jacob Llyod who scored that evening 14 points and 4 assists and the former international guard Kareem Edwards (193-90) supported him with 10 points and 10 rebounds. Even a double-double of 11 points, 15 rebounds and 7 assists by the former international center Mahijah Davis (195-77, college: Cent.Oklahoma) did not help to save the game for Ottos. Guard Xavier Meade added 17 points and 10 rebounds (was perfect 9-for-9 from the free throw line !!!) for the guests. Both teams had four players each who scored in double figures. Potters S. have a solid three-game winning streak. They keep a position of league leader, which they share with Cutie Ovals Ojays. Ottos at the other side keep the fifth place with four games lost. Baldwin Braves (#4) were upset in by seventh ranked Stingerz 83-75. They dominated down low during the game scoring 54 of its points in the paint compared to Baldwin Braves' 24. Stingerz forced 22 Baldwin Braves turnovers. The best player for the winners was guard Leroy Percival who had a double-double by scoring 16 points, 12 rebounds and 4 assists. Guard Keroi Lee chipped in a double-double by scoring 20 points and 11 rebounds. Five Stingerz players scored in double figures. American guard Brian Holmes (185-91, college: Georgia South) produced 26 points, 6 rebounds and 6 assists and his fellow American import guard Ronald Lucas-III (198-93) added 17 points, 12 rebounds and 4 assists respectively for the hosts. Baldwin Braves' coach tested ten players, but that didn't help to avoid defeat in this game. Stingerz (4-3) moved-up to sixth place. Loser Baldwin Braves keep the fourth position with two games lost. The most exciting game of round 8 in the ABBA took place in . This derby game ended with only one-point defeat on the road of 5th ranked Ottos (5-4) to first ranked Cutie Ovals Ojays (7-1) 77-76 on Sunday evening. Cutie Ovals Ojays forced 23 Ottos turnovers. Worth to mention a great performance of American guard Joshua Minner (198-90, college: MidAmerica Ch.) who helped to win the game recording 30 points and 4 assists and the other American import point guard Jermaine Bolden (178-86, college: Morgan St.) who added 12 points, 5 rebounds and 12 assists during the contest. Guard Xavier Meade responded with a double-double by scoring 20 points and 12 rebounds and American guard Troy Vasco (196) produced a double-double by scoring 14 points and 15 rebounds. Five Ottos players scored in double figures. Ottos' coach rotated ten players in this game, but that didn't help. Cutie Ovals Ojays have a solid four-game winning streak. They maintain first position with 7-1 record, which they share with Potters S. Ottos at the other side keep the fifth place with four games lost. Rather expected game when 10th ranked Rebels (1-8) were crushed at home by seventh ranked Yorks Crushers (4-5) 97-77 on Saturday. Yorks Crushers forced 24 Rebels turnovers and outrebounded them 65-31 including a 47-21 advantage in defensive rebounds. Rebels were plagued by 32 personal fouls down the stretch. Worth to mention a great performance of guard Cohen Desouza who helped to win the game recording a double-double by scoring 35 points (!!!) and 21 rebounds and the former international guard Decosta Walbrook who added 20 points and 14 rebounds during the contest. American guard Dontarion Wright (190, college: LeMoyne-Owen) responded with 38 points (!!!) and guard Gija George scored 16 points and 8 rebounds. Rebels' coach let to play ten players seeing no chance for a win. Yorks Crushers maintains seventh position with 4-5 record. Rebels lost seventh consecutive game. Newly promoted team stay at the bottom place with eight games lost. The game in was also quite interesting. Second ranked Potters S. (7-1) played at the court of 7th ranked Stingerz (4-3). Potters S. managed to secure a 4-point victory 88-84 on Thursday. Potters S. forced 21 Stingerz turnovers. They looked well-organized offensively handing out 23 assists. Worth to mention a great performance of the former international guard Kareem Edwards (193-90) who helped to win the game recording 30 points, 6 rebounds and 4 assists and American guard Darius Daniels (178, college: Texas Wesleyan) who added 15 points, 5 rebounds and 7 assists during the contest. Guard Keroi Lee responded with a double-double by scoring 16 points and 11 rebounds and American point guard James Barbee (178, college: Point, GA) scored 19 points and 5 assists. Both teams had four players each who scored in double figures. Potters S. have a solid three-game winning streak. They keep a position of league leader, which they share with Cutie Ovals Ojays. Loser Stingerz dropped to the sixth place with three games lost. Very predictable result when second ranked Potters S. (7-1) defeated at home 8th ranked HS Outlaws (2-7) 90-76 on Saturday. Potters S. dominated down low during the game scoring 64 of its points in the paint compared to HS Outlaws' 32. Potters S. forced 27 HS Outlaws turnovers. They looked well-organized offensively handing out 22 assists. Worth to mention a great performance of Kebo Orford who helped to win the game recording a double-double by scoring 18 points and 15 rebounds and the former international guard Kareem Edwards (193-90) who added 18 points during the contest. Four Potters S. players scored in double figures. Potters S.'s coach used a ten-player rotation which allowed the starters a little rest for the next games. Ishaan Peets responded with 30 points and 8 rebounds and guard Andrew Venture produced a double-double by scoring 22 points and 10 assists. Potters S. have a solid three-game winning streak. They keep a position of league leader, which they share with Cutie Ovals Ojays. Loser HS Outlaws keep the eighth place with seven games lost. 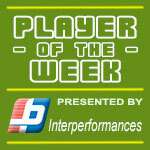 American Joshua Minner (198-G-90) put on an amazing game in the last round for league's leader Cutie Ovals Ojays and that's him to receive a Interperformances Player of the Week award for round 12. The 28-year old guard had a double-double of 51 points and twelve rebounds, while his team crushed Yorks Crushers (#7, 5-8) with 18-point margin 107-89. It allowed Cutie Ovals Ojays to consolidate first place in the Antiguan ABBA. Cutie Ovals Ojays has a very good season and are considered to have a run for the championship title. They improved their record to 11-1. In the team's last game Minner had a remarkable 82.4% from 2-point range and got seven three-pointers out of 9 attempts. He turned to be Cutie Ovals Ojays' top player in his first season with the team. Joshua Minner averages this season 29.4ppg and 6.3rpg. The second most remarkable performance in last round's games was 28-year old international guard Kareem Edwards (193-G-90) of second-ranked Potters S.. Edwards impressed basketball fans with a double-double of 28 points and 10 rebounds. Of course he led Potters S. to another comfortable win outscoring the lower-ranked Rebels (#10, 1-12) 109-49. This victory allowed Potters S. to move up to second position in the standings. His team lost just two games this season, while they won 10 matches. Edwards is a newcomer at Potters S. and it seems he did not have too much trouble to become one of team's leaders. The third best performed player last round was Cohen Desouza (G) of Yorks Crushers (#7). Desouza scored 23 points and grabbed seventeen rebounds (!!!). Despite Desouza's great performance Yorks Crushers lost 89-107 to the higher-ranked Cutie Ovals Ojays (#1, 11-1). But his team cannot count on just a single player as he also needs help of the other teammates. The chances of Yorks Crushers not to end season at such low position in the league, however are less than slim as they have already lost 8 games, recording just five victories. With bigger assistance of his teammates, Desouza could try to bring Yorks Crushers' a little bit higher in the standings. Desouza has a very solid season. In 12 games in Antigua he scored 21.7ppg. He also has 13.3rpg, 3.1apg, 2.1spg and FGP: 56.4%. There will be only one (last) round of the Regular Season in ABBA. What a coincidence that all visitors won their games. Here is the last round review presented by ESL. The most exciting game of round 12 in the ABBA took place in . This derby game ended with only three-point home defeat of 3rd ranked Potters S. (10-2) to fifth ranked Stingerz (7-3) 86-83 on Sunday evening. Stingerz outrebounded Potters S. 62-44 including a 26-14 advantage in offensive rebounds. 30 personal fouls committed by Potters S. helped opponents get some easy free throw opportunities. 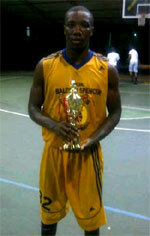 The best player for the winners was guard Keroi Lee who had a double-double by scoring 23 points and 17 rebounds. The former international guard Vivian Destin (193-86) chipped in 21 points, 7 rebounds and 6 assists. At the other side the best for losing team was American forward Benny Iko (201, college: Winnipeg) who recorded a double-double by scoring 23 points, 12 rebounds and 4 assists. Stingerz have a solid four-game winning streak. They moved-up to fourth place. Potters S. at the other side dropped to the second position with two games lost. Stingerz are looking forward to face Ottos (#6) in the next round. Potters S. will play against Baldwin Braves (#5) and is hoping to win this game. Leader Cutie Ovals Ojays delivered the eleventh victory. This time they crushed 8th ranked Freetown T. (2-8) 106-79. It was a good game for American guard Joshua Minner (198-90, college: MidAmerica Ch.) who led his team to a victory with 31 points and 8 rebounds. Bryan Matthew contributed with 27 points and 10 rebounds for the winners. Guard Marlon Davis (-77) replied with 22 points, 8 rebounds and 5 assists for Freetown T.Cutie Ovals Ojays (11-1) have an impressive eight-game winning streak. They maintain first position. Freetown T. lost third consecutive game. They keep the eighth place with eight games lost. Cutie Ovals Ojays will play against league's second-placed Potters S. in the next round and it will be for sure the game of the week. Freetown T. will play against Yorks Crushers (#7) and it may be a tough game between close rivals. Leader Cutie Ovals Ojays recorded the eleventh victory on Sunday night. This time they beat 7th ranked Yorks Crushers (5-8) 107-89. Worth to mention a quality performance of Joshua Minner who helped to win the game recording a double-double by scoring 51 points (!!!) and 12 rebounds (on 21-of-26 shooting from the field). The best for the losing side was Cohen Desouza with a double-double by scoring 23 points and 17 rebounds. Cutie Ovals Ojays (11-1) have an impressive eight-game winning streak. They maintain first position. Loser Yorks Crushers keep the seventh place with eight games lost. Cutie Ovals Ojays will meet at home league's second-placed Potters S. in the next round and it will be for sure the game of the week. Yorks Crushers will play against Freetown T. (#8) and it may be a tough game between close rivals. The game with biggest result difference took place in . Local Rebels (1-12) were outscored by third ranked Potters S. (10-2) 109-49. The winners were led by Kareem Edwards who had that evening a double-double by scoring 28 points and 10 rebounds. Potters S. moved-up to second place. Rebels lost eleventh consecutive game. Newly promoted team stay at the bottom position with 12 games lost. Potters S.'s next round opponent will be Baldwin Braves (#5). Rebels will play against HS Outlaws (#9) and it may be a tough game between close rivals. The game with biggest result difference took place in . Local Rebels (1-12) were outscored by third ranked Potters S. (10-2) 109-49. Potters S. dominated down low during the game scoring 60 of its points in the paint compared to Rebels' 36. Potters S. forced 30 Rebels turnovers and outrebounded them 46-32 including a 37-20 advantage in defensive rebounds. Their players were unselfish on offense dishing 25 assists comparing to just 6 passes made by Rebels' players. The winners were led by the former international guard Kareem Edwards (193-90) who had that evening a double-double by scoring 28 points and 10 rebounds and American forward Benny Iko (201, college: Winnipeg) supported him with 21 points and 7 rebounds (on 8-of-10 shooting from the field). Four Potters S. players scored in double figures. Even 20 points and 5 rebounds by guard Ariel Quallis did not help to save the game for Rebels. Guard Gija George added 9 points and 8 rebounds. Potters S. moved-up to second place. Rebels lost eleventh consecutive game. Newly promoted team stay at the bottom position with 12 games lost. Potters S.'s next round opponent will be Baldwin Braves (#5). Rebels will play against HS Outlaws (#9) and it may be a tough game between close rivals. Leader Cutie Ovals Ojays delivered the eleventh victory. This time they crushed 8th ranked Freetown T. (2-8) 106-79. They outrebounded Freetown T. 56-39 including a 41-25 advantage in defensive rebounds. It was a good game for American guard Joshua Minner (198-90, college: MidAmerica Ch.) who led his team to a victory with 31 points and 8 rebounds. The former international forward Bryan Matthew (196-76, college: Iona) contributed with a double-double by scoring 27 points and 10 rebounds for the winners. Guard Marlon Davis (-77) replied with 22 points, 8 rebounds and 5 assists and John Rolland added 12 points and 11 rebounds in the effort for Freetown T.Both teams had four players each who scored in double figures. Cutie Ovals Ojays (11-1) have an impressive eight-game winning streak. They maintain first position. Freetown T. lost third consecutive game. They keep the eighth place with eight games lost. Cutie Ovals Ojays will play against league's second-placed Potters S. in the next round and it will be for sure the game of the week. Freetown T. will play against Yorks Crushers (#7) and it may be a tough game between close rivals. The most exciting game of round 12 in the ABBA took place in . This derby game ended with only three-point home defeat of 3rd ranked Potters S. (10-2) to fifth ranked Stingerz (7-3) 86-83 on Sunday evening. Stingerz outrebounded Potters S. 62-44 including a 26-14 advantage in offensive rebounds. 30 personal fouls committed by Potters S. helped opponents get some easy free throw opportunities. The best player for the winners was guard Keroi Lee who had a double-double by scoring 23 points and 17 rebounds. The former international guard Vivian Destin (193-86) chipped in 21 points, 7 rebounds and 6 assists. Four Stingerz players scored in double figures. At the other side the best for losing team was American forward Benny Iko (201, college: Winnipeg) who recorded a double-double by scoring 23 points, 12 rebounds and 4 assists and Jacob Llyod added 20 points and 6 assists respectively. Stingerz have a solid four-game winning streak. They moved-up to fourth place. Potters S. at the other side dropped to the second position with two games lost. Stingerz are looking forward to face Ottos (#6) in the next round. Potters S. will play against Baldwin Braves (#5) and is hoping to win this game. Leader Cutie Ovals Ojays recorded the eleventh victory on Sunday night. This time they beat 7th ranked Yorks Crushers (5-8) 107-89. Cutie Ovals Ojays forced 20 Yorks Crushers turnovers. They looked well-organized offensively handing out 28 assists comparing to just 8 passes made by Yorks Crushers' players. Worth to mention a quality performance of American guard Joshua Minner (198-90, college: MidAmerica Ch.) who helped to win the game recording a double-double by scoring 51 points (!!!) and 12 rebounds (on 21-of-26 shooting from the field) and the former international forward Bryan Matthew (196-76, college: Iona) who added 24 points, 5 rebounds and 4 assists during the contest. The best for the losing side was guard Cohen Desouza with a double-double by scoring 23 points and 17 rebounds and the former international guard Gerard Henry (203-86) scored 16 points and 7 rebounds. Four Yorks Crushers players scored in double figures. Cutie Ovals Ojays (11-1) have an impressive eight-game winning streak. They maintain first position. Loser Yorks Crushers keep the seventh place with eight games lost. Cutie Ovals Ojays will meet at home league's second-placed Potters S. in the next round and it will be for sure the game of the week. Yorks Crushers will play against Freetown T. (#8) and it may be a tough game between close rivals. Former international Guard Vivian Destin (193-G-86) had an amazing evening in the last round for Stingerz, receiving a Interperformances Player of the Week award for round 11. The 32-year old player was the main contributor (29 points, seven rebounds and four assists) to his team's victory, helping them to outclass Freetown T. (#8, 2-7) with 30-point margin 92-62. Stingerz is placed at 4th position in Antiguan ABBA. They would have been even better if they hadn't lost a few games earlier this season. Stingerz will need more victories to improve their 7-3 record. In the team's last game Destin had a remarkable 75.0% from 2-point range and got three three-pointers out of 7 attempts. He turned to be Stingerz's top player in his first season with the team. Vivian Destin has solid league stats. He is in league's top in assists (3rd best: 5.8apg) and averages impressive 4.1spg. The second best player in last round's games was another Stingerz's star - Keroi Lee (G). Lee had a very good evening with a double-double of 21 points and 18 rebounds. Of course together with Destin he helped Stingerz with another comfortable win outscoring the lower-ranked Freetown T. (#8, 2-7) 92-62. This victory allowed Stingerz to move up to 4th position in the standings. His team's 7-3 record is not bad at all. Lee is a newcomer at Stingerz, but is already one of team's top players. He belongs to the best scorers in the league with 18.9ppg (#9). He also registered 11.7 boards per game. 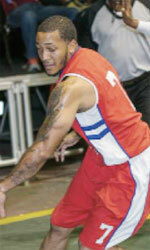 Third on the list of top players last round was Canadian center Torey Fassett (198-C) of league's top team Flyers. Fassett showcased his all-around game by recording 25 points, thirteen rebounds (!!!) and five assists in the last round. He was a key player of Flyers, leading his team to a 90-69 easy win against the lower-ranked HS Outlaws (#9, 2-11). Flyers confirms their top position in the standings. Their record at this point is 10 victories and 3 lost games. Fassett has a great season in Antigua. After 13 games, he made it on the list of the league's leaders in points with 25.9ppg (3rd best) and rebounds with 10.2rpg (7th best). He also has 3.5spg and FGP: 60.8%.